Marcus Aurelius:From my great-grandfather, not to have frequented public schools, and to have had good teachers at home, and to know that on such things a man should spend liberally. Homeschooling or homeschool (also called home education or home based learning) is the education of children at home, typically by parents or by tutors, rather than in other formal settings of public or private school. Marcus Aurelius, Meditations, Book I, verse 4 (translated by George Long). Most of the homeschooled children I know have about the same amount of after-school peer time as the rest of the population—but, obviously, without that school day together, they do spend less time with their peers. Whether that’s a good thing or a bad thing is still open to debate. Quinn Cummings, in The Year of Learning Dangerously: Adventures in Homeschooling, p. 21. Homeschooling works because schooling is not the same thing as education. School is not the only place to learn, to grow up. Universities and colleges recognize this fact whenever they admit homeschoolers who have never attended school. Mahatma Gandhi:There is no school equal to a decent home and no teacher equal to a virtuous parent. Mahatma Gandhi, in Matriculate To Your Perfect Degree Course, p. 161. David Guterson, "When Schools Fail Children: An English Teacher Educates His Kids at Home", Harper's Magazine (November 1990). David Guterson, Family Matters: Why Homeschooling Makes Sense (1992), Ch. 5: "School, Home, and History", p. 109. Rachel Gathercole, in The Well-Adjusted Child: The Social Benefits of Homeschooling, p. xxiii. 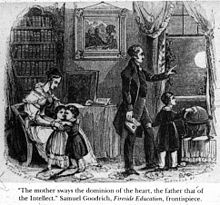 John Caldwell Holt was one of the earliest homeschool pioneers in addition to being an American author, educator, and early researcher in youth rights theory. He became disillusioned with the public school system after numerous years of working within it and seeking reform. Ultimately, he decided that public school reform was not possible and Holt started advocating homeschooling. He believed that "children who were provided with a rich and stimulating learning environment would learn what they are ready to learn when they are ready to learn it". John Holt, Who Is John Caldwell Holt (Author). HomeschoolBase.com (2002). Retrieved on 2017-04-26. Diane Flynn Keith, in Page 54 - 2013 CATALOG April 24 2013 Final. David O. McKay, in Mormon Parenting Secrets: Time-Tested Methods for Raising Exceptional Children, p. 11. This page was last edited on 27 April 2017, at 11:52.